The term ‘hybridity’ has been around for a long time and, for most of its history of use, has been pressed into the most disparate – and often dubious – services. In recent times it has become a sort of transdisciplinary ‘buzz word’ and it was about time that Systemic Functional Linguistics (SFL) also raised its voice on the subject. This volume addresses the increasingly typical hybrid nature of text and discourse. In an SFL perspective, this also means that cultural and situational contexts must be seen as being always potentially hybrid or, as Hasan has fittingly put it, ‘permeable’, such permeability being based on the powerful activation/construal dialectic between discursive situation and language, system and instance. The authors of the papers in this collection variously focus on hybridity within sociocultural contexts in which discourse occurs, investigate hybridity of discourse types (in a wide range of genres, registers, text-types, etc. ), but also examine hybridity within the stratum of lexicogrammar itself. Moreover, the implications of hybridity for education and the professions are explored. The volume makes plain the multifaceted complexity of the phenomenon, as well as its rich potential as a theoretical construct in SFL. Part IV A closing statement: Hybridity – or permeability? This volume unites a diversity of reflections on the nature and effects of hybridity, a theoretical concept covering a range of discourse phenomena from the merging of functions within the clause to the re-articulation of social signifiers within public and institutional discourse. Taken together, the contributions demonstrate the essential permeability and coevolution of language and social life at all levels, with hybridity as the dynamic driving force. 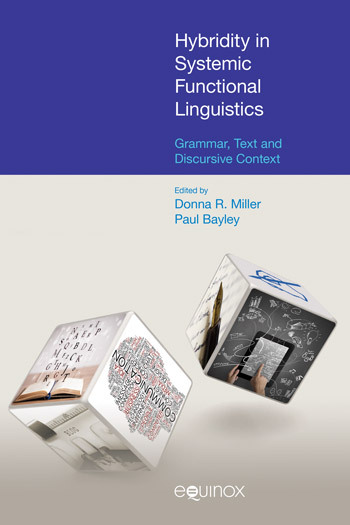 This volume persuasively demonstrates how the extravagant architecture of Systemic Functional Linguistics provides a theoretical perspective well-suited to the analysis of this complex concept and, in doing so, significantly enriches the theory itself. Overall, this book provides a comprehensive and insightful framework for the analysis of hybridity within SFL and will be an excellent reference for researchers working on SFL, hybridity, discourse analysis, stylistics or language teaching. Hybridity in Systemic Functional Linguistics is of great value for the following four reasons. Firstly, it covers various categories of hybridity-grammar, text and context, and provides a comparatively systematic study of hybridity from the perspective of Systemic Functional Linguistics, thus refuting Norman Fairclough’s statement that SFL cannot have anything valid to say about hybridity since it lacks a system corresponding to the ‘order of discourse’. Secondly, the volume is characterized by interdisciplinary study, which is not only testified by the interface between SFL and cognitive linguistics, and the synergy between SFL and CL, but is also proved by the selection of corpora from different areas, like linguistics, mathematics, and literature. Moreover, since many contributors have exemplified the status of SFL as an appliable linguistics (e.g. Caroline on the applicability of SFL in dealing with university learning, Cummings on a historical text, and Sabrina on institutional and newspaper discourse), it is believed that the appliability of SFL should be one of its future directions. Last but not least, each chapter is well organized with clear logic and structure, which makes the book easy to follow and accessible to readers. The book is much to be recommended to any student, lecturer, or researcher interested in hybridity. Overall, the volume adds to readers’ vectors for appreciating and investigating those linguistic phenomena that may be labeled as exhibiting fuzziness, indeterminacy, intersection, agnation or features subject to double coding, no matter whether the issue of hybridity or permeability emerges at the stratum of lexicogrammar, semantic discourse or context. This suffices to guarantee, in my view, that the volume will be welcomed by scholars and researchers interested in functional grammar, discourse analysis, genre analysis and the semogenesis of social semiotic resources. The volume offers much to language teachers, discourse analysts and language theorists, with the main strength of the volume being the inclusion of a rich array of highly instructive and engaging exemplar texts, situations and analytical approaches and a clear demonstration that SFL indeed has much to say about hybridity in discourse. A very valuable monograph on systemic functional linguistics. It is just like a beautiful chorus, meeting the needs of the development of the era. Not only does it prove the systematic nature of hybridity research in systemic functional linguistics, but it also refutes the idea that systemic functional linguistics lacks an adequate cognitive element (Miller & Bayley 2016: 4). All in all, it deserves to be carefully read by scholars who are committed to the study of systemic functional linguistics, cognitive linguistics, pedagogy, second language acquisition, professional practice, discourse analysis and stylistic analysis.